Products : Chicago Blowers : Design 5120 Planum Fans - Draft Air, Ahmedabad, Gujarat, India. Leave it to Chicago Blower to take a perfectly reliable fan and offer a quieter, more efficient, less costly alternative. It's the new Design 5120 plenum fan that widens the performance envelope. It simply packs more power in a smaller footprint. The Design 5120 plenum is a rugged fan built to Chicago's industrial level of quality and long-term dependability. You can rely on the performance and durability of Chicago Airfoil Plenum Fans. 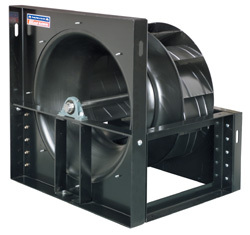 Plenum fans are specified for both field built-up units and factory built air handlers, and can be installed either horizontally or vertically. Applications include supply air, return air, and exhaust. Chicago now catalogs the widest selection of plenum fans.